My Armour Models Collection: Good Old Days! Just a quick post! The other day I was browsing through Ebay's website, and I came across a page full of all the old Matchbox models! That brought back a lot of memories! I cut my model making teeth on these models and I recognised nearly all of them, I'm sure the neighbours must of heard my sudden cries of "I had that model and that one, that one as well"!! The nostalgia of the moment almost brought a tear to my eye! I sometimes regret getting rid of all my old Matchbox models, but I had to make room for my Tamiya models, so unfortunately they had to go! and is now for sale on Ebay! 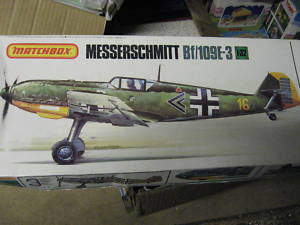 I am so tempted to ask my wife if she'll buy me that 1:32 scale Messerschmitt model, but I must resist the temptation, I really don't have the room for it on my shelves. It was a big model if I remember correctly! Oh well, I guess I'll just have to stick with the happy memories of those early years of my model making!